39 balloons and one dolphin - what did the ocean receive for Valentines Day!?! I often wonder how people can hunt whale, hunt turtle, or hunt shark - what overcomes them to track magnificent animals and kill them for particular parts of their body; "parts" that are economically valued higher than the "whole" animal's ecological and social value to Earth. While running along the Santa Monica shoreline tonight, I soaked in a dose of such predatory adrenaline as I hunted plastic balloons - washed up to the beach and resting like deflated sea lions. In front of Pier 26, I watched the first balloon make its way to shore from about 20 yards out at sea - surfing the waves, searching for dry land. 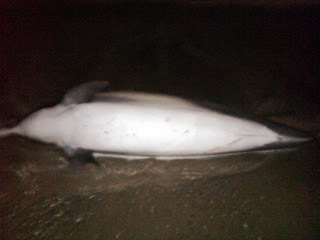 And at Pier 28 about twenty minutes later, I watched a hunted dolphin make the same journey - in whole. First, the balloon - I placed it in a nearby trash can where two other balloons were captive. Three balloons! I run this beach often and find drinking straws, bottle caps, cigarette butts, but never three balloons in such close proximity. Four days ago these balloons served as gifts of love and compassion, their recipients silently attached dreams and let go - watching the balloon float away, praying the dream would find its reality. However, the balloon floats a few miles above ground, begins to deflate, gravity does the rest - and in the end only finds my wet feet. Unfortunately, the three balloons turned to 10 then to 16 - it was amazing, I was hunting!! My heart raced, my eyes scanned for more and more plastic balloons and my legs hastened to chase them down and scoop them off the beach. I ended up with 39 in total within 250 yards of the Santa Monica/Venice shoreline. I gathered my last clump of about 23 and marveled at the assortment: red ones printed with "I love you," an orange one with "Happy Birthday," a clear one with red writing, "Be Mine." I then realized this grouping of puffed-up plastics was not the "killed," but the "killers." Balloons, along with other plastics, strangle seabirds and sea lions, get eaten by whales and dolphins, eventually degrade and threaten our food supply. Indeed, cupid's arrow signifies so much more now. I had to stop and catch my breath after shoving the last 23 in the trash can, before turning around and heading back to where I started, and then home. Almost dark, would I stumble upon any newly washed ashore balloons? Fortunately, no more - but just there, what is that in the waves? 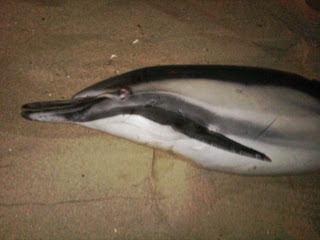 sloshing back and forth...a freshly deceased Common dolphin. What an unfortunate, yet invigorating evening - I have hunted both balloon and dolphin. In ankle high water, the dolphin attempts to find some solid ground. But only after alerted lifeguards pull her out of the water is she resting - her dorsal fin covered with the same sand that hides my toes. She will be picked up in the morning by the Natural History Museum of Los Angeles to be autopsied. The lifeguards mentioned that they rarely do this, but I spoke with the Marine Mammal Center and unfortunately several dolphins have been pulled in the last few weeks. What will be her cause-of-death? A plastic balloon clogging her intestines, nasty pollutants spawning cancers? I will follow this dolphin and report back. 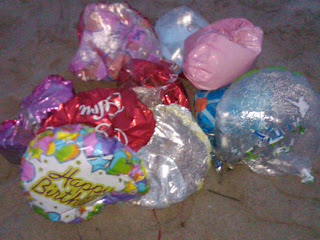 But as the dolphin traveled away from me, I recollected the 39 balloons that I tracked - and wondered at a coincidence? Funny how we watch Whale Wars and the Cove and condemn the Japanese for hunting whale and dolphin with harpoon, yet each day we continue our Gulpable lifestyle of disposable plastics and toxic chemicals, we all hunt them the same with our disconnected waste, our pollutants, our greed - even our compassion, on this post-Valentines day. In talking to family and friends about the "gulpable" plastic in the ocean that often ends up in the stomach of marine wildlife (most notably the images of dead baby albatrosses on Midway Atoll), one family member asked astonished, "How does a golf ball and toothbrush end up all the way out there?" 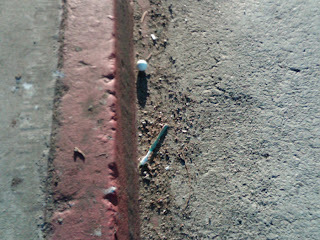 A few days after that question, I interestingly stumbled upon a golf ball and toothbrush just inches away from plunging down a Santa Monica storm drain - no doubt on their way to meet our Midway friends. 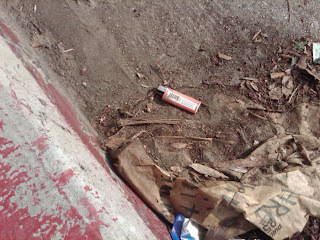 And today, during a walk along Melrose (between Fairfax and La Cienega) in West Hollywood, this cigarette lighter looked up at me. With rain in the weekly forecast, off it goes - to kill.